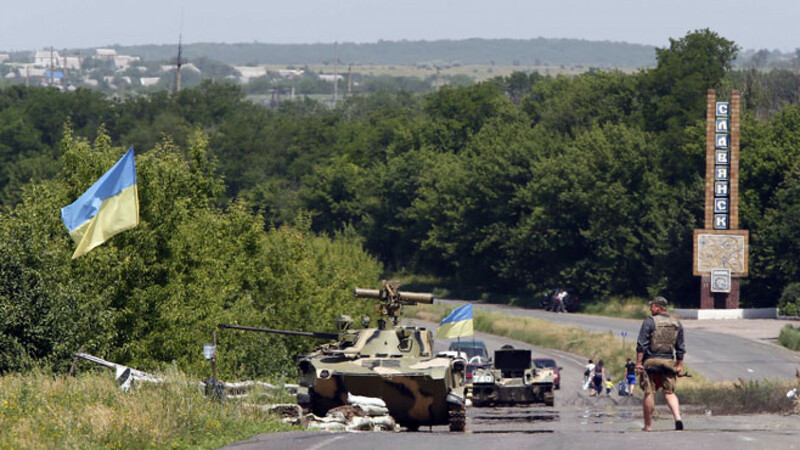 Ukrainian servicemen patrol at a checkpoint outside the eastern Ukrainian town of Slaviansk June 4. Government forces pressed on with an offensive in eastern Ukraine on Wednesday, claiming they had inflicted heavy losses on separatist fighters, though this was denied by the rebels. A spokesman for Kiev's "anti-terrorist operation" said more than 300 rebel fighters had been killed and about 500 wounded in fierce fighting in the past 24 hours in and around the city of Slovyansk, a strategically located separatist stronghold. Government forces used aircraft, helicopters and artillery in a fierce attack to try to root out the separatists who have controlled Slovyansk and surrounding areas since early April. But the rebels on Wednesday denied the government's casualty figures. "Reports of 300 dead are not true. Losses to the Ukrainian side were more than ours," Aleksander Boroday, "prime minister" of the self-proclaimed Donetsk People's Republic, said, Interfax reported. Describing the fighting as "heavy", the government forces spokesman, Vladyslav Seleznyov, said two servicemen had been killed and 45 wounded. Fighting was continuing in Slovyansk region and mopping-up operations were underway in the nearby town of Krasny Liman, which he said government forces had taken control of on Tuesday. President-elect Petro Poroshenko ordered the resumption of operations by government forces to quell the rebellion by pro-Russian militia in the Russian-speaking east soon after scoring a resounding victory in an election on May 25. The Kiev government says the fighting is being stirred up by Moscow, which opposes its pro-Western course. Kiev also accuses Russia of letting volunteer fighters cross into Ukraine to fight alongside the rebels. Moscow denies this and is urging Ukraine to end military operations and open dialogue with the separatists. Since government forces resumed their push against the rebels, there have been clashes in and around the main industrial hub of Donetsk and near the border town of Luhansk, with loss of life on both sides. But it is not clear what real progress the Ukrainian military — whose initial efforts in April to root out the rebels flopped with defections and loss of military equipment — are making against the rebels who occupy strategic points in densely populated cities. Slovyansk, a town of about 130,000 and located at the centre of the three main regions of eastern Ukraine, was quickly taken under the control of the rebels in early April and government forces have had little success in weakening their grip on the city. The offensive in Slovyansk followed a day-long firefight on Monday in Luhansk, a town further to the east on the Russian border, after an attack by separatists on a border guard camp. Government forces acknowledged on Wednesday that the border guard camp had been evacuated and personnel had left with their weapons, though the separatists described this as a surrender. Zhanna, a resident of a nearby apartment block, said she saw guns and ammunition being removed from the base. "The [separatist] militia has taken over the building and lowered the Ukrainian flag," she said.